Best known today for inventions like the telegraph, Morse early had aspirations of becoming a painter and spent five years (1811-15) in London studying art. Despite unsuccessful efforts to encourage an appreciation of history painting among patrons in New York, Morse rose to prominence as an artist in the 1820s and 1830s. 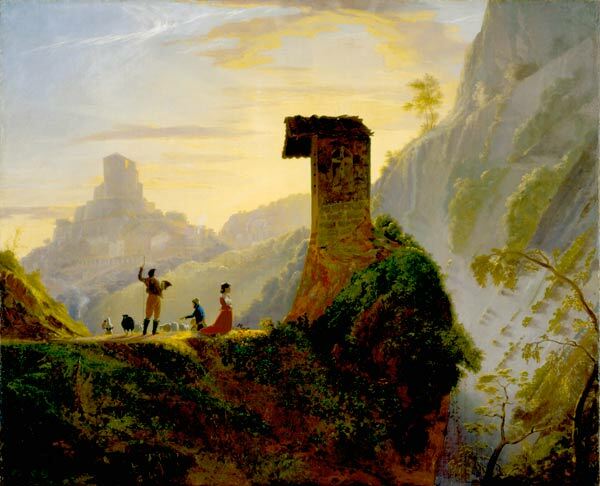 On a second trip to Europe in April 1830, Morse encountered in Rome a fellow American, Stephen Salisbury II of Worcester, who commissioned a painting. This view of a wayside chapel in the Sabine Mountains on the road to Subiaco, sketched during an excursion, was painted in Morse's Rome studio. The Museum now owns not only the finished work but also two preparatory oil sketches- one depicting the shrine and surrounding landscape (acc. no. 1941.16), another of the shepherds and flock (acc. no. 1991.15). Comparison of the final composition and the landscape study shows that Morse transformed the naturalistic palette and even quality of noonday light in the study to create a more dramatic mood: the finished painting is distinctive for its brilliant, artificial palette and strong, late-afternoon light.